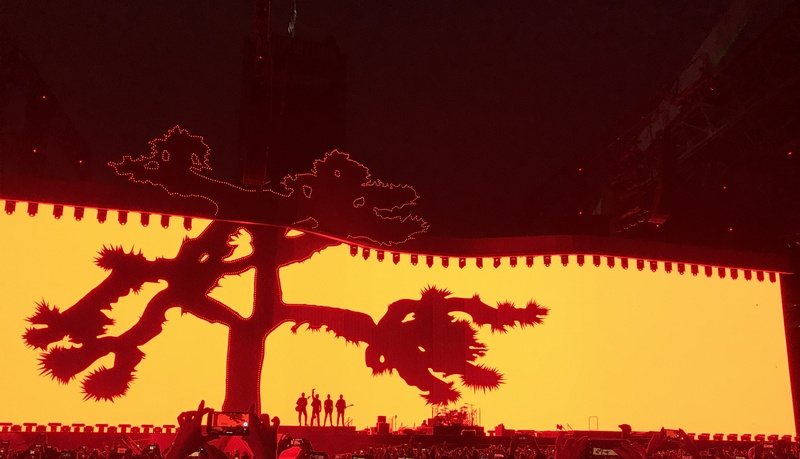 I was immensely inspired last weekend after attending the opening shows of U2’s The Joshua Tree Tour 2017. While Vancouver acted as an unveiling of the band’s latest brilliant and beautiful artistic statement, the second show in Seattle served as a perfect refinement that will most likely take a few twists and turns by the tour’s end* in Europe this July. Never predictable — and always intentional (even with setlist mainstays that “non-fans” expect to hear) — U2 has a penchant for attempting to top their creations, tour after tour, for over four decades. Whether it’s in their playing, their chops, the enormity of the stage and production, or the message they are trying to convey. Only this time, an unusual one in our history, they are assigned into celebrating the 30th anniversary of a full album, played in sequence. It works so well in the context of the story of America (one that is actually told through the songs on The Joshua Tree), that you forget the album came out so long ago, when things were… different? And during this show — with its absurdly beautiful cinematic presentation complimenting the songs on an 8K high definition stadium-wide screen, and a Joshua tree imprint B-stage (the concert B-stage-with-catwalk being a concept U2 invented) bringing at least 40% of the impossibly intimate performance out to the “real” fans — U2 delivers. By leaps and bounds. With 57-year-old singer Bono who seemingly has a voice that constantly improves with age, a fit and powerful rhythm anchor in Adam Clayton and Larry Mullen Jr., and The Edge, who has rearranged some of The Joshua Tree songs in ways you never thought possible. The show is highly political. And if you don’t know that U2 never backs down from their left-of-center and human rights centric stances, and highly motivating calls for action against atrocities in poverty, the AIDS epidemic, equal rights for women, and more — or if you are bothered by it — then, one must wonder: is U2 the band for you? Trump appears (Bono recently stated that the current “president” isn’t welcome at the shows, but his voters are), but not in the way you would expect. Anger towards what he and his administration represent is scattered throughout the show. And with Seattle rock philanthropist Eddie Vedder’s guest vocals on “Mothers Of The Disappeared,” and subsequent cheers for his appearance, is any indication — most people are on U2’s side. The most emotional moment occurs during “Miss Sarajevo” — one of several celebratory odes to womankind during the show — in which a young Syrian girl named Omaima fills up the screen and implores the audience not for compassion, but more importantly, for understanding. An acknowledgement that Syrians are not our enemies, but are humans, like us, who are looking for community, safety, and love. And you can’t put up a wall against love. The English translation for Luciano Pavarotti’s solo in the song pleads, “Beyond the borders and the thirsty lands. You say that as the river. As the river, you say that love will find a way.” The Joshua Tree Tour 2017 teaches us the idea of America — its openness to others — is still intact, but in grave danger of damming that river for good. The Joshua Tree hopes to bring this sentiment to the masses one more time. For the sake of history. *U2 later added a third leg to The Joshua Tree Tour 2017 that extended into October, with additional dates in the United States, Mexico City, and stadiums across South America.